The Samsung Q1 was one of the first tablet-design ultra-mobile PC (UMPC) that was part of the Microsoft Origami campaign. 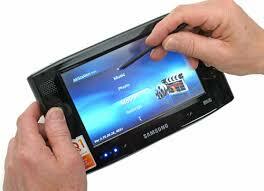 Then, Samsung came out with the Q1 Ultra UMPC (to confuse people with the naming convention). The Q1 Ultra was also called the Q1U and had a BlackBerry-style keyboard on the front of the device. The buttons were so small that most people couldn't use it, so then they started asking, "what's the point of this the tiny keyboard?" To maximize battery life, Samsung used a very slow processor in the Q1 Ultra. Since the Q1 Ultra was so slow, Samsung created the Q1 Ultra Premium (once again, the naming convention was to confuse consumers and healthcare professionals who use tablet computers). This model was called the Q1UP. Are you keeping up? We have the Q1, the Q1U, and now the Q1UP. Keep in mind that these are all considered ultra-mobile PCs (or UMPCs), so the "U" for "ultra" gets redundant if you're calling it the Q1 Ultra Ultra-mobile PC. The Q1UP looked almost identical to the Q1 Ultra, but it was thicker and the tiny keyboard buttons were a bit larger and were placed in a slanted position. This device was overpriced and still underpowered. The latest Samsung Q1model is the Q1EX-71G (or Q1EX for short). This model is a simple slate with no buttons or keys on the front. So in some ways, Samsung has almost made a complete circle with their Q1 line of ultra-mobile PCs. Now, if this naming convention isn't confusing, then what is?